I hear the word “disruptive” bandied about these days in reference to new (or supposedly new) gadgets and gear that manufacturers think will somehow revolutionize whatever industry they happen to be in. A lot of these PR pitches find their way into my inbox … and subsequently into my ever-expanding Gmail Trash folder. (Your performance socks and coffee mugs are “shaking up” the performance sock and coffee mug industries? Really?). Suffice to say that I was a bit skeptical when Hylete reached out to us with an offer for a 6-in-1 backpack that aims to be all things to all people. Traveler, gym-goer, desk jockey — whatever your flavor, their Icon pack is allegedly for all of you! 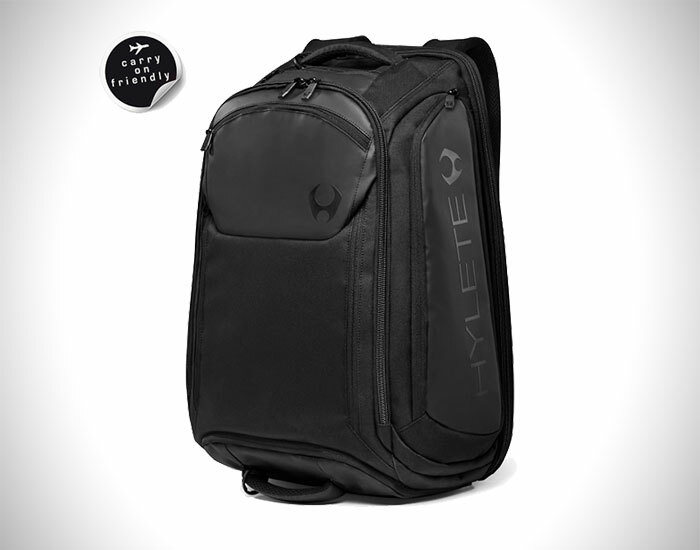 But, after poring over the features of the Hylete 6-in-1 40L Backpack, this thing is the real deal. It’s hands-down the smartest, most cleverly designed pack I’ve ever personally tested. … perfect bag, 6 times over. As the name suggests, the icon has 6 distinct conversions: backpack, extended backpack, small duffle, large duffle, removable daypack, and messenger bag. Travel the world with nothing but a carry-on, commute to work, or detach the daypack with laptop sleeve for a productive sit at your local coffee shop. That’s usually the extent of a backpack review. But, the 6-in-1 Backpack is a whole other animal. There’s so much ingenuity going on in just 40L. At it’s core, the Icon is about versatility. Hylete’s 40L pack was built on the wild success of the larger Icon 6-in-1 60L. As the name suggests, this smaller sibling offers all the same convertibility. It’s at once a backpack, extended backpack, small duffle, large duffle, a messenger bag, and a removable daypack. All in a single carry-on size bag. The key to all this Swiss Army-knifery lies in two cleverly designed features. The first is an expandable pouch on the bottom of the bag that drops down to add an additional 15L of space. It tucks away behind the zippered panel and into the guts of the main compartment when you don’t need it, but it expands in seconds when you do. It’s this compartment that allows you to go from “small backpack” to “extended backpack” mode. Or, with the aid of the included shoulder strap, to switch from “small duffel” mode to “extended duffle” mode. 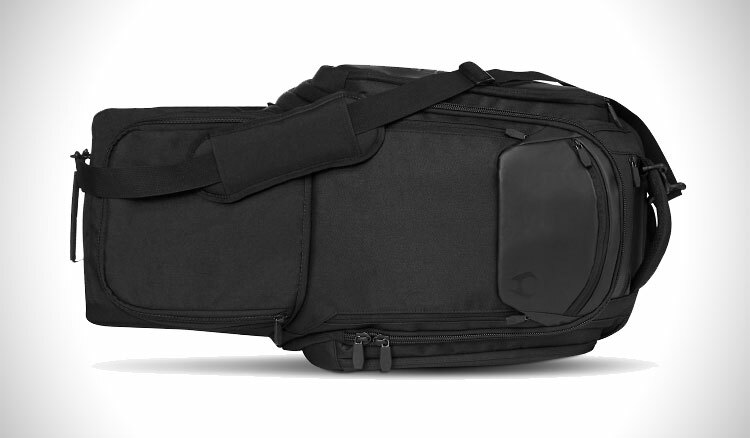 The second most important design feature allows the rear compartment to zip off completely and function as a standalone daypack (perfect for a full-size laptop, smartphone, small digital camera, headphones, and other essentials). Again, with the help of the shoulder strap, you can easily go from “daypack” mode to “messenger bag” mode in seconds. And there’s a host of secondary features I love. The padded backpack straps are thick, ventilated, and incredibly comfortable, and an adjustable sternum strap ensures the bag fits snugly against your body. A series of fleece lined pockets provide added protection for your electronics, a puppy, or anything that requires “a soft touch.” The 6-in-1’s exterior is also weather and abrasion resistant, so it’s designed to take whatever the road can throw at it. Lastly, two insulated side pockets provide space for chilled water bottles, or if you need a spot to keep your damp gear separate from everything else in your pack. Add in a few packing cubes and you’re good to go! I’ve long been a fan of spending a bit more on solid, well-made gear. And, while some may balk at the $200 price tag for the Hylete 6-in-1 Backpack (40L), trust me: it’s worth it. This truly is a pack for anyone. A jack-of-all-trades, and master of them too. The post Hylete 6-in-1 Backpack Is a Jack-of-all-trades … and Master of Them Too appeared first on Vagabondish.